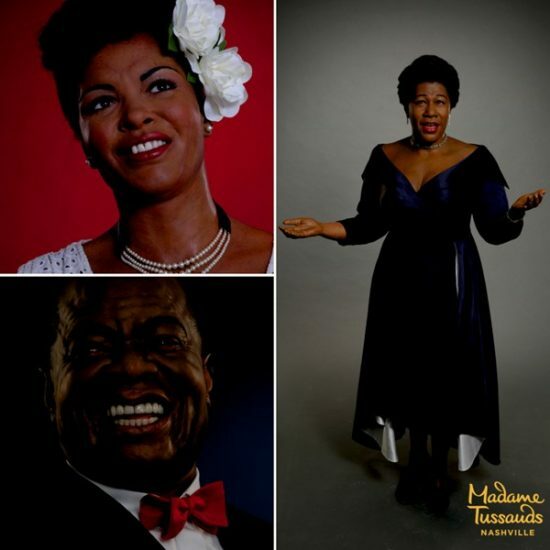 Madame Tussauds has a total of 25 locations across four continents, but its newest attraction in Nashville, Tenn., set to open in April, will be unique for its replicas of three legendary figures in jazz history: Ella Fitzgerald, Billie Holiday and Louis Armstrong. Part of Tussauds’ first music-centric museum in the U.S., the jazz icons are portrayed as per their respective heydays—Fitzgerald in her blue dress, standing in song with her arms open; Holiday by a vintage mic, with a gardenia in her hair and strand of pearls; Armstrong in tuxedo and red bowtie, with his signature smile and Selmer trumpet. Each figure is the product of months of research, crafted by teams of artists and sculptors who use over 300 measurements for accuracy. The Nashville location will be filled solely with artists who have been strong influences on American music and songwriting. Additional figures will include Beyoncé, Johnny Cash, Jimi Hendrix, Taylor Swift and Stevie Wonder. For more information visit the museum’s official website.